So I cycled 60 miles yesterday – and the only part of my body that hurts is the one part that has absolutely nothing to do with riding my bike – my teeth! This does seem a little unfair but ‘hey’, I’m deeply, deeply grateful that no other bits of me are hurting. Some bits creak a bit but they don’t actually hurt. Only 2 weeks to go till the ‘the big ride’ and that’s the first time I’ve done the maximum distance. It was a beautiful day, the scenery was amazing and I found it gets very, very hilly south of Daventry. My top speed down one of the hills was 34 miles an hour – and that required a loud ‘Yeeee Ha!‘ which somewhat alarmed the nearby cows. This photo was not taken at that speed. 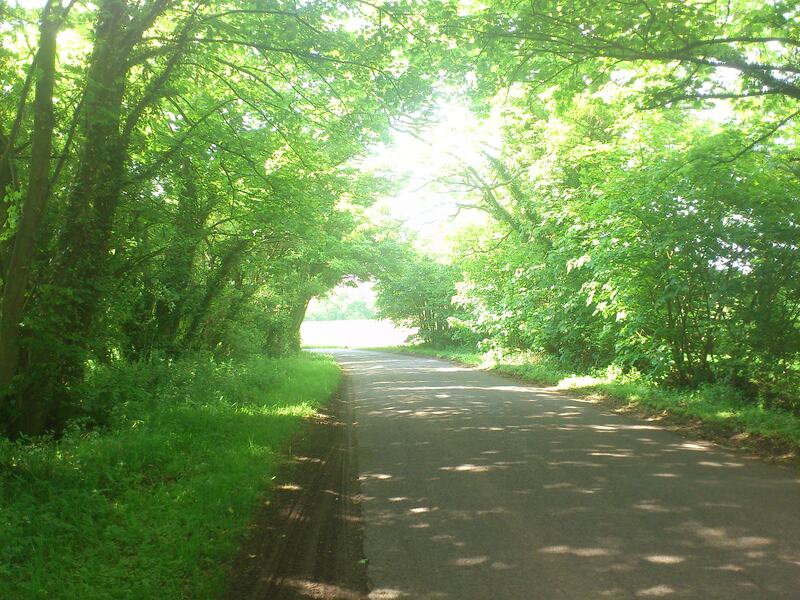 I took it while I stopped for a snack in a lovely shady lane. That’s one of the great things about cycling: the calorie intake!